The welfare of invertebrates is overlooked and their needs are not understood. It is assumed that they do not experience pain and suffering. Studies on decapod crustaceans challenge this assumption. Research has focused on distinguishing between nociception (the ability to detect a harmful stimulus and to react to it reflexively) and pain (an aversive feeling or emotional experience). Findings indicate that decapod crustaceans can experience pain, which supports a case for protecting their welfare. I have investigated the current husbandry conditions of a globally consumed decapod crustacean, the lobster, as housed in tanks inside food outlets in the UK. Housing conditions of 325 lobsters were scored on four factors: restraints, stocking density, lighting and shelter. The data indicate that the basic requirements for lobsters are not being met, thereby compromising their welfare. I recommend research on the welfare of lobsters and other decapod crustaceans, not only when housed in tanks, but also during capture, handling and transport. Such information can be used to inform legislative change. Gemma Carder is a researcher for World Animal Protection and a scientific advisor for Crustacean Compassion. Gemma’s research is on domestic and wild animal behaviour and welfare. 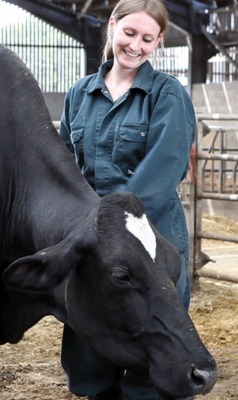 Her recent research has centred on identifying behavioural and physiological measures of emotional states in dairy cows. She has an interest in applying research findings to aid animal welfare campaigns.